It’s not often that a new and substantial niche is pioneered in the transport industry, but somehow, this one hadn’t been filled before now. Polaris today introduced the first Robby Gordon edition, the all-new RANGER RZR 4, a sport side-by-side capable of carrying four passengers. The RZR 4 has an 800cc Twin EFI engine behind the back seat for the lowest center of gravity, and at 569 kg, it’s lighter than many two-seaters. For optimal, agile handling on any terrain, RANGER RZR 4 features long travel suspension with 12 in/30.5 cm of suspension travel and ground clearance. The unit’s premium suspension includes new Fox Podium X 2.0 Piggyback Reservoir Shocks plus Chrome Moly front upper A-Arms for precision and strength. The rear anti-sway bar and dual rate springs keeps the chassis flat through corners and the rolled independent rear suspension (IRS) provides a smooth ride through all terrain. To tackle tough terrain, RANGER RZR 4’s suspension is coupled with Polaris’ true all-wheel drive (AWD) system that automatically engages when the rider needs more forward traction and reverts back to 2WD automatically when AWD is no longer needed. In creating the first four-passenger Sport Side-by-Side, Polaris paid close attention to ergonomics. For the driver, RANGER RZR 4 has class-leading tilt steering offering 10 in/25.4 cm of range and a heel pocket for unmatched throttle response and control. The front passenger will enjoy an industry-exclusive adjustable front passenger handrail, while the rear passengers an ample amount of head-room and an exclusive rear passenger handrail. Similar to the front passengers, rear passengers also have a 12-volt plug in and two cup holders. All four bucket seats are interchangeable and offer 4 in/10.2 cm of front-to-rear adjustability making it easy to switch drivers. 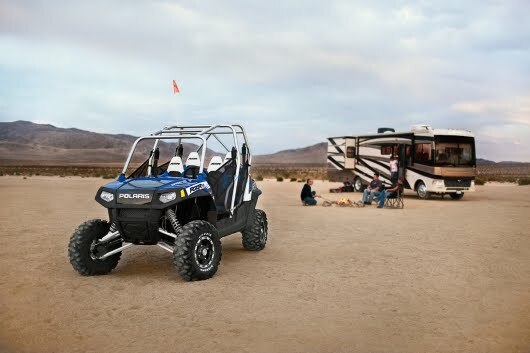 For safety, RANGER RZR 4 has four side protective nets. The RANGER RZR 4 also features graphics from Robby Gordon’s TORC truck he raced at Crandon, Wisconsin, as well as, No. 7 NSCS Toyota Camry he raced during the NASCAR Sprint Cup Series Labor Day Classic 500. The Black, Blue and White theme sports the Robby Gordon Off-Road logo on the front side panels with race-inspired graphics, cut-and-sew seats and Maxxis Big Horn tires with Black Bruiser Rims making the vehicle the sharpest-looking Side-by-Side on the market. “At Robby Gordon Off-Road, we build the highest performance, most elite off-road vehicles in the world. I hope Polaris customers like the new RANGER RZR 4 Robby Gordon Edition as much as we do,” said Robby Gordon. 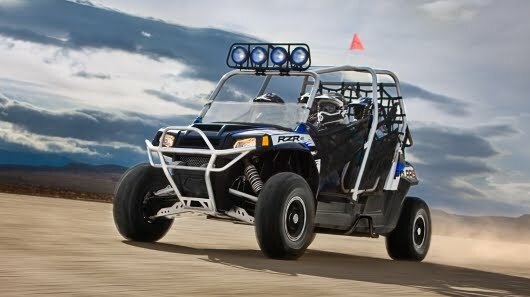 The RANGER RZR 4 will be available at Polaris dealerships in January, with a MSRP of USD14,999. 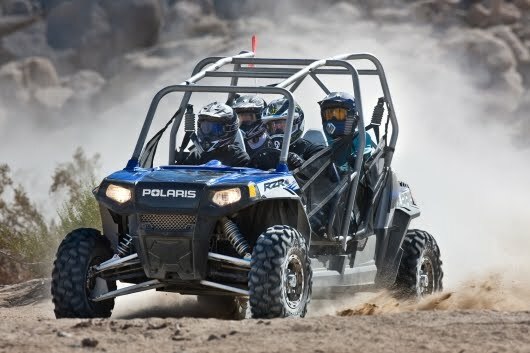 A full line of PURE Polaris accessories, including roofs, cabs, bumpers, brushguards, windshields and Lock & Ride products also will be available, including many of the existing RANGER RZR and RZR S accessories that fit the RANGER RZR 4.